Looking at the picture on the right, one may wonder why are there ants surrounding the two caterpillars? This is because both of them share a very special relationship known as ant-caterpillar mutualism. In fact, there are many species of butterflies from the Lycaenidae family that associate with ants and the small, green creatures [above] are the larvae of the Miami Blue Butterfly Cyclargus thomasi bethunebakeri [left]. 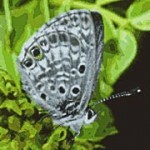 The Miami Blue is one of Florida’s rarest endemic butterflies and is currently listed as a ‘state-endangered’ species. So what exactly is the relationship between the caterpillar and its ant partners? The Miami Blue caterpillar emits semiochemicals i.e. message bearing molecules that are used as signals from a pair of tentacular organs and secretes a sugar-rich solution from its endocrine glands that has the ability to attract, appease and recruit ‘tending ants’. In return, the ants tend to the caterpillar’s needs and protect them from a variety of natural predators and parasitoids. 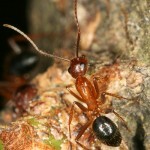 While Miami Blue larvae associate with several species of ants, the predominant ant species that attends to the larvae is the Carpenter Ant Camponotus floridanus. 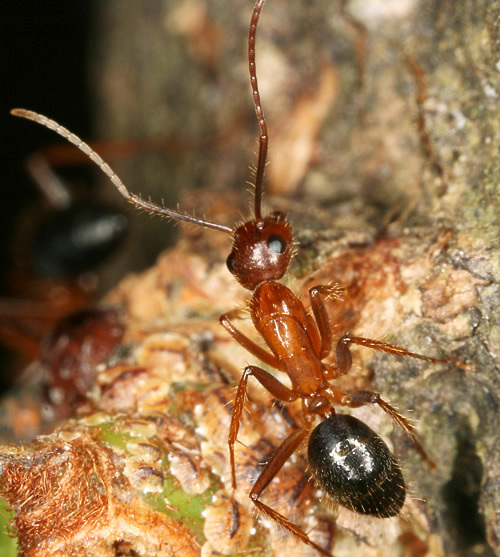 These large and potentially aggressive ants may prove to be effective in deterring predators. The video (below) illustrates the unique acquaintance between a caterpillar and its ant counterpart. From the video, one can see that the relationship between the caterpillar and its tending ants involve a complex array of chemical, tactile and audible signals. Besides the immediate benefit of having friendly ants as bodyguards, ant-caterpillar mutualism is also linked to enhanced larvae growth and development. However, certain ant species may also act as predators while the friendly ants do not always succeed in protecting the larvae. 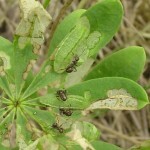 Furthermore,ant-caterpillar mutualism is not always beneficial for the caterpillars. The production and loss of secretions to ants result in a loss of nutrients that can be put to other uses such as larvae development and pupal growth. This can cause larvae to pupate at smaller sizes, which reduces insect fitness in the long run. Yet, some caterpillars possess an ability to compensate for nutrients lost to ants although the exact mechanism is not known. One hypothesis is that tending larvae may feed more and digest food more efficiently, thereby increasing its pupal weight. Overall, this marriage of convenience between caterpillars and ants illustrates the coming together of two very different individuals that share a common goal – survival! Fraser, .M Ann, Axen, H. Annkristin and Pierce, E. Naomi. “Assessing the qualify of different ant species as partners of a myrmecophilous butterly”. Oecologia, vol. 129, 2001, p. 452-460. Wagner, Diane. “Species-specific effects of tending ants on the development of lycaenid butterfly larvae”. Oecologia, vol. 96, 1993, p. 276-281. Trager, D. Matthew and Daniels, C. Jaret. “Ant Tending of Miami Blue Butterfly Larvae (Lepidoptera: Lycaenidae): Partner diversity and Effects on Larval Performance. The Florida Entomologist, vol. 92 (3), Sept 2009, p. 474-481. “Ant Caterpillar Mutualism” by flyconrye. Youtube, (15 Mar 2008). URL: http://www.youtube.com/watch?v=z3bWqlPLpMg&feature=player_embedded (assessed on 04 Apr 2010). “Miami Blue Butterfly”. 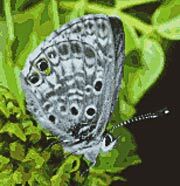 URL: http://www.butterflyrecovery.org/species_profiles/miami_blue/ (assessed on 05 Apr 2010). “Ants and Blue Butterflies”. URL: http://blog.wildaboutants.com/2010/01/10/ants-and-blue-butterflies/ (assessed on 04 Apr 2010). “Camponotus floridanus”. URL: http://www4.ncsu.edu/~bsguenar/Pics%20Campo%20floridanus.html (assessed on 05 Apr 2010). This entry was posted in Uncategorized and tagged Group20 by u0600999. Bookmark the permalink.